STANLEY Security offers the industry’s leading National Account Program. STANLEY makes the most of your valuable time with the National Accounts Program to coordinate your security and fire needs. There’s no need to qualify a variety of service providers and manage multiple service contracts. We offer a single-source national security solution with a single point of contact—all customized to your systems, preferences, and procedures—for easily understood location reports, simplified billing, and centralized administrative procedures. Our professional team will ensure on-time installation to your national standards. STANLEY Security is dedicated to providing operational excellence for our National Account Customers in the Five Customer Touchpoints of Account Management, Installation, Service, Monitoring, and Billing. You will be assigned a National Account Program manager who will help determine standards for security and fire protection, access control, monitoring, and ongoing service. In addition they will help you maintain standards that address your local, regional, and national requirements. Your National Account Manager will establish system design, pricing, installation, service, and billing for all your facilities to drive consistency across locations and meet your company’s requirements nationwide. Plus, you’re able to streamline your activity by making just one phone call to your National Account Program manager instead of synchronizing security with several companies. While some security providers offer a limited service based on their expertise—STANLEY can accept responsibility for multiple critical building functions including fire, security services and central monitoring—at every one of your locations. Our Customized Activity Reports keep you abreast of important building events and expenses. You can even access the data or activity for your facilities online, real-time via our eServices. 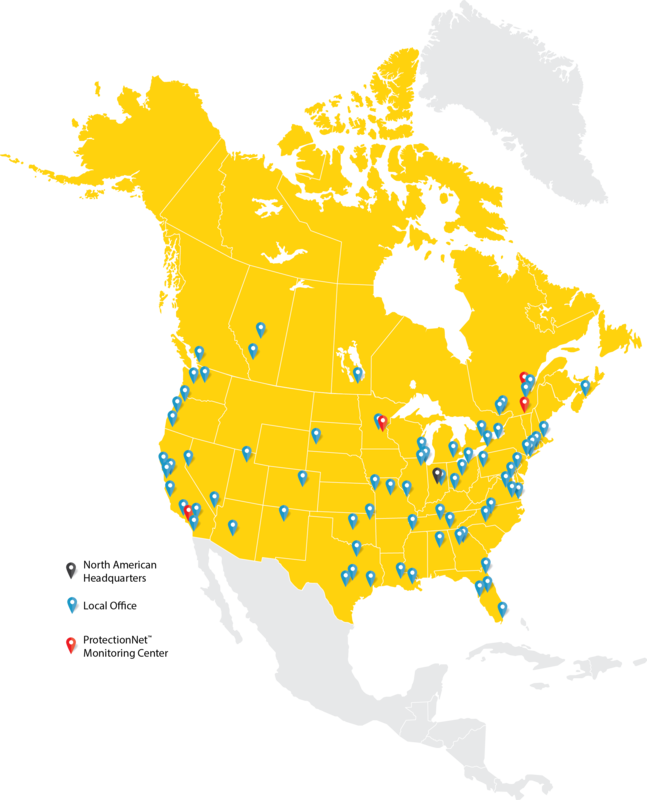 With over 75 offices in North America, and operations around the world, STANLEY is a true National Account provider providing global security support. STANLEY provides a true business partnership with an “open book approach” through our eServices and our National Account Performance Scorecard. With four UL, ULC, and FM Approved ProtectionNet Customer Service Centers in North America, and around the globe, we provide a dedicated bilingual monitoring team and redundancy for disaster recovery. Uniform pricing helps you control costs and provides useful budgeting information. STANLEY provides Customized Billing for our National Account Customers, including combined billing, which clearly lists all recurring expenses on one invoice. Contact STANLEY today to get in contact with a National Account Manager to discuss your organization’s unique security program.